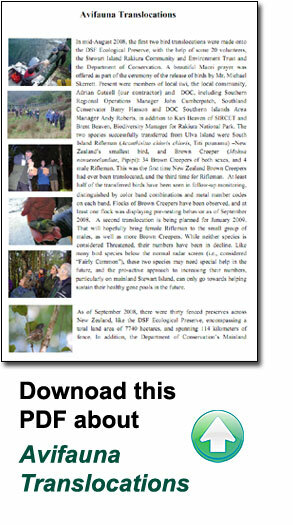 In mid-August 2008, the first two bird translocations were made onto the DSF Ecological Preserve, with the help of some 20 volunteers, the Stewart Island Rakiura Community and Environment Trust and the Department of Conservation (DOC). A beautiful Maori prayer was offered as part of the ceremony of the release of birds by Mr. Michael Skerrett. Present were members of local iwi, the local community, Adrian Gutsell (our contractor) and DOC representatives, including Southern Regional Operations Manager John Cumberpatch, Southland Conservator Barry Hanson and DOC Southern Islands Area Manager Andy Roberts, in addition to Kari Beaven of SIRCET and Brent Beaven, Biodiversity Manager for Rakiura National Park. The two species successfully transferred from Ulva Island were South Island Rifleman (Acanthisitta chloris chloris, Titi pounamu) — New Zealand’s smallest bird, and Brown Creeper (Mohua novaeseelandiae, Pipipi): 34 Brown Creepers of both sexes, and 4 male Rifleman. 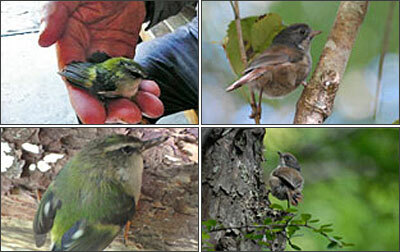 This was the first time New Zealand Brown Creepers had ever been translocated, and the third time for Rifleman. At least half of the transferred birds have been seen in follow-up monitoring, distinguished by color band combinations and metal number codes on each band. Flocks of Brown Creepers have been observed, and at least one flock was displaying pre-nesting behavior as of September 2008. While neither species is considered Threatened, their numbers have been in decline. Like many bird species below the normal radar screen (i.e., considered “Fairly Common”), these two species may need special help in the future, and the pro-active approach to increasing their numbers, particularly on mainland Stewart Island, can only go towards helping sustain their healthy gene pools in the future. As of early 2010, there were at least a total of 17 Riflemen as well as 34 Brown Creepers on the Preserve including Brown Creeper fledglings have been seen. Among the Riflemen, breeding behavior has been witnessed. 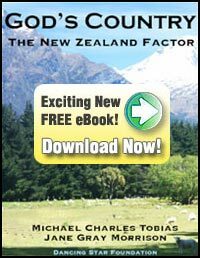 As of September 2008, there were thirty fenced preserves across New Zealand, like the DSF Ecological Preserve, encompassing a total land area of 7740 hectares, and spanning 114 kilometers of fence. In addition, the Department of Conservation’s Mainland Island Program comprises an additional 11,900 hectares of protected land. Together, converging methodologies being applied by both government, private and non-profit sectors reveal the passionate and shared aim of staving off further declines among all native species in the country. Data from two fenced government preserves in Central Otago, installed for purposes of protecting Giant and Otago Skinks have shown an increase in species population sizes by 66% and 34% respectively, in just two years after the fence installation. (Information provided by Roger MacGibbon of the Xcluder Fence Company, September, 2008). This kind of data has been consistent with the fenced preserves throughout the country. DSF specifically has seen remarkable regeneration of native flora and fauna since its fence installation in 2004/2005. Latest Rifleman Transfer a Great Success! In February, 2011, over a week’s time, 21 riflemen/titipounamou were caught on Ulva Island and trans-located to the DSF preserve on Stewart Island/Rakiura where they all bounced happily out of their boxes into the property. These birds included a relatively even mix of adult males, females and juveniles. Juveniles made up half of the total number, which is an excellent result as they have the longest time ahead of them to contribute their genes to the establishing population. They look to also be an equal mix of males and females, though it can be hard to tell in the early juvenile phase. 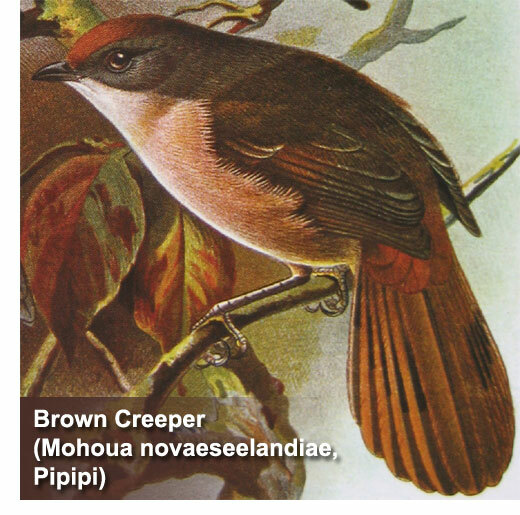 A survey for brown creeper/pipipi and riflemen/titipounamu identified several breeding groups of unbanded riflemen, both with banded birds and in completely unbanded family groups. Brown creeper groups were also confirmed still breeding inside the Preserve. Kari Beaven led the effort, aided by volunteers Morag and Simon Fordham and Fraser Crichton. We are deeply grateful to Kari, Morag, Simon and Fraser for their brave yet delicate efforts and a successful translocation. Thank you all!